While it's normal for cats to chew on things (even things that aren't meant to be chewed), sometimes the behavior can get out of hand. It's potentially dangerous to the cat, not to mention damaging to your belongings. But since cats explore with their mouths, they're going to chew on things. There are a few possible medical conditions that may cause excessive chewing in cats, including teething in kittens. But the top cause of chewing in house cats is boredom, which is (relatively) easily remedied. Why Do Cats and Kittens Chew? Before settling on boredom as the reason for your cat's chewing habit, take it to the veterinarian to rule out a medical issue. A cat with gum disease may gnaw on things to soothe its mouth, and a cat with a digestive issue may chew and drool on things to show something is amiss. Obsessive-compulsive disorder, nutritional deficiencies and early weaning all are possible medical causes for chewing. Periodontal disease, which is an inflammation of the gums, is very common in cats and is usually treated with fluoride and antibiotic gel applied to the mouth. How your vet treats a gastrointestinal ailment will depend on the severity and nature of the illness (and a cat with a digestive problem will show more signs than just chewing that it is sick). If there's no underlying medical cause, chances are you've got a bored cat on your hands. 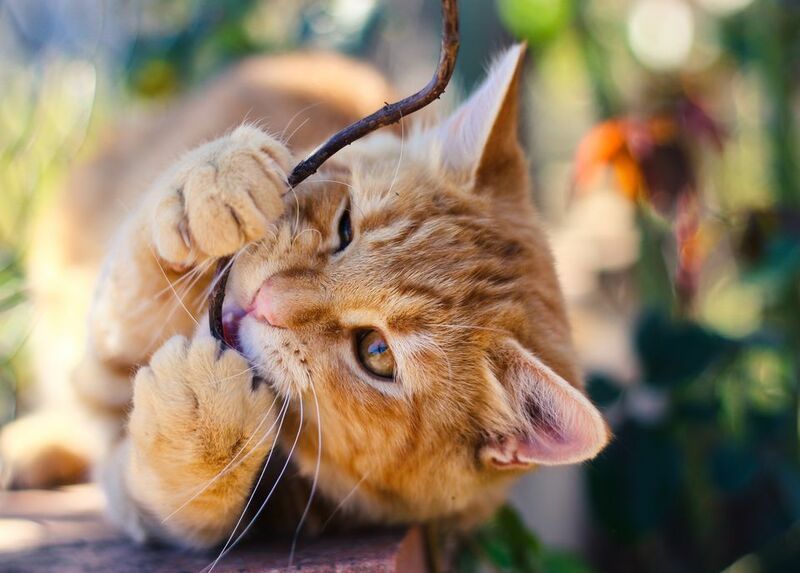 It may not seem like a kitten could get into too much trouble chewing, but there are some serious hazards around the house you may be overlooking. The most common objects of kittens' chewing are wires and cords, houseplants and fabric or leather furniture. Each item requires a slightly different approach to prevent the cat from chewing. Cats usually find cords and wires to chew on especially if left alone during the day. Try to provide plenty of "play alone" toys for your cat or kitten, including wall or door mounted toys they can swat or bat around, cat towers to explore, with attached toys for added interest, or even an arrangement of cardboard boxes on the floor to form a tunnel, with holes cut through the sides. To handle the cord situation itself, you need to devise a way to cover the cords, discourage access to them, or make them unpalatable for chewing. Cover the cords: Many computer supply stores carry pre-split hollow tubing for covering cords and electrical wires, as well as kits for managing computer cords. If you're handy with a utility knife, you can purchase flexible poly tubing in several diameters in most building supply or hardware stores. Slit one side of the tubing, then cut it to length for each cord. You might also try larger "corrugated" tubing to run several wires through if that works for you. Discourage access to the cords: Try applying several rows of double-sided sticky tape to the floor surrounding a large cord tangle (such as frequently happens with computers). Cats will be reluctant to walk across the tape. Make the Cords Taste Bad: By far one of the best training tools for any kind of destructive chewing is bitter apple spray. It is guaranteed to leave a bad taste in your cat's mouth, one that he won't long forget. Be advised you may need to reapply this to the area you want your cat to avoid, especially if you have a persistent cat. Try CritterCords Cord Protector, to cover cords. Cats have a natural desire for greenery to chew, and your live houseplants might become a target. Some of these plants can be extremely toxic to cats, and for your cat's safety, you need to learn to recognize and get rid of these plants. Check this list of toxic plants to see if any of your houseplants are on it, then either discard or make those plants completely unavailable to your cat. Wool chewing falls under the realm of OCD. For the kind of chewing behavior we're discussing here, the best way to discourage such behavior is to offer other "legal" chewing sources for your cat, e.g. chewable soft toys. If you can't put away all the fabric and leather items your cat likes to chew on, try some bitter apple spray on the area where it usually chews, but test it first on a small hidden seam to ensure it doesn't stain. There's one item that works wonders with kittens' teething: plastic drinking straws, especially the large ones used for milkshakes. They provide the crunchy contact kittens need, and they make a great interactive toy. You can derive lots of interactive play by teasing your kitten with the straw, then let him "capture" it and watch him proudly carry around his "prey." Adult cats may remember their straws, so it's not unusual to see one of them batting one around the floor. Although most often effective with dogs, clicker training can be used in cats. Usually a small, hand-held device, the trainer or pet owner will make a clicking noise when the animal performs the desired behavior. In order for clicker training to be effective, the click must be immediately followed by a treat for the animal, so it learns to associate the action and the click with a positive experience. It's not effective in most animals, particularly not in cats, who will not associate bad behavior with the negative reinforcement you're intending.